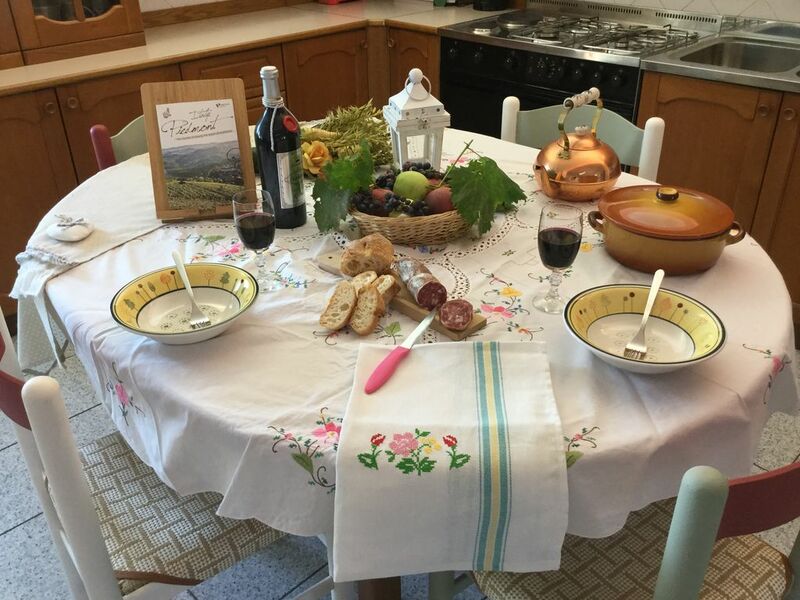 You will all be welcome in my house in Gorzano, a small village located between Langhe Roero and Monferrato, a strategic place for those wishing to visit the wonderful and evocative Piedmontese places. Living room, large kitchen / living room, master bedroom, small double bedroom, hallway, living room with sofa bed, a bathroom with shower, utility room with washing machine, long balcony. Apartment located on the second floor without elevator ( two flights of stairs), private entrance. Garden with barbecue, large terrance with table and chairs on the ground floor. Apartment located near the church with a bell tower. enjoy the tranquility of the countryside. very interesting and very pleasant. Gorzano is a small village belonging to the municipality of San Damiano d'Asti from which it is about 4 km. In the village there are two mini markets, a sports center with bar. The four nearest supermarkets are in San Damiano d'Asti (4 km). the third week of July. Typical Piedmontese dishes washed down with good wine, all surrounded by music, games and dances. In the summer you can participate in the many village fairs that are held in the areas. Très bon séjour Piemontais de trois jours dans une maison très bien équipée. Bon accueil de la propriétaire et de son fils . De charmantes attentions à notre arrivée (ingredients pour petit déjeuner, produits locaux, petits gâteaux maison). Charmants échanges avec la grand-mère qui habite au dessus et qui nous a donné l'illusion que nous comprenions parfaitement l'italien! Visite de la région viticole des Langhe et Monferrato inscrit au patrimoine mondial de l'UNESCO. Parfait pour un séjour étape en Italie. From Milan: Torino Piacenza motorway exit A21-E70 ASTI OVEST, take the SS10 on the right and drive for about 2 km. At the roundabout of the Palucco area take the second exit on the left to San Damiano SP 58. Drive for about 12 km. At San Damiano, at the first roundabout, take the first exit on the right to Villanova Sp12. Continue for about 1.5 km until you reach the church of San Giulio, which you will find on your right (turn), turn left for Gorzano Sp 12. Go about 3 km until you see a small sign for Gorzano on the right. Turn right, go about 1 km and get in front of the church of Gorzano. From the church proceed and take the second road on the right (just after the white / gray fence of a red brick house), go up a part of the slope and turn to the first street on the right. Arrived in a courtyard with houses, proceed forward until you arrive at my house (white) where the road ends. At the entrance you will see the old wagon in the garden. From Turin: Torino Piacenza motorway exit A21-E70 VILLANOVA D'ASTI (Attention: keep RIGHT). Take Ss10 for Asti for about 2 km. At the second traffic light, turn right onto the SP 19 towards San Damiano d'Asti. Travel approximately 18 km. After San Pietro, arrive in front of the church of San Giulio that you will find on your left (turn), turn right for Gorzano Sp 12.